When I got the port place, it felt awkward. It was like, “Holy crap, there’s something popping out of my chest.” Not actually popping our of my chest, but it’s there and it’s foreign and it’s weird. I still sort of feel that way, but I’m used to it. So back to the beginning. I remember being afraid that if I sneezed a really good sneeze, like one of those muscle-popping sneezes, that the port would just pop out of my chest. I can’t explain why I felt that way, or how I thought that could happen, but I totally did. I presented this concern to the doctor, even though I was fairly sure it was an irrational concern. She said not to worry, that port wasn’t going anywhere. Enter jump castle. Correction. Enter jump castle obstacle course. I thought it would be wise to show how great my endurance was and how quickly I could move through the jump castle obstacle course since I’ve been getting so much exercise, building muscle, etc. So after going through it once solo, I decided to race my sister-in-law. You can imagine how this went. Long story short, we collided somewhere in the middle. She sprained her wrist, I overstretched my left arm, and I’m pretty sure I popped a stitch on my port because there’s a little wobbliness that wasn’t there before. I’ll see my surgeon this week and she can check it out, but everyone at the oncologist said it looked okay. It is attached to my jugular, so if there was an issue, I’d know about it by now. It’s been over a week and I’ve had an infusion through it, and nada. So yeah…if you have a port…maybe jump castles aren’t the best place to be…or at least a jump castle race might not be the best decision. Oh! I did win the race against my sister-in-law, but I then challenged my brother-in-law and lost miserably. Second moral of the story – when you’ve got something crazy going on with your toenail, jump castles might not be the place to be. So this was a tad bit different than the first. Of course, I had the port, so it was easy access. It was much cooler having everything go through my chest than my arm, I could flail all I wanted and no tubes were disrupted…not that I flailed. Who me?? So yeah, JP is less apparent. He’s still there. But he’s not as firm and close to the surface as he was, at least he doesn’t feel that way. It’s so hard to tell through all the fluffy tissue, but there’s absolutely a change. Also, there was a lady there getting chemo today. She was across the room so we didn’t chat, but I overheard her saying that this was her last round, and on her last ultrasound the doctor couldn’t even find the mass! I don’t know what type of cancer she has (or had?! ), but how awesome is that? That’s exactly what I want to happen. It would be an epically awesome Christmas present. My next ultrasound is scheduled for October 27th, the same day as my next echocardiogram. Then my next chemo cycle will be that following Monday. Back to today. I was there from about 8:30 until 2:00. It was much shorter since there wasn’t a loading dose and they shorten the administration of some of the drugs since I showed tolerance to them the last time. Maybe tolerance isn’t the right word, maybe it’s durability? Ha! I don’t know, but basically I didn’t have any reactions or immediate side effects, so instead of administering the dose over an hour, they did thirty minutes or forty-five. That was nice! This was post-Benadryl, so I was pretty loopy, but remembered I needed a pic! To access the port, they clean the area with alcohol, then there’s a little scrub brush with some cleaner, it kind of looks like one or those sponges on the end of a tube that you fill with soap to clean inside glasses? Anyway, they do that. Now, approximately thirty minutes before my appointment, I put some lidocaine cream on the site to numb it a little bit. Yeah…I still felt the initial prick. I mean, it’s a needle going through some decently thick skin, into the port. It stung a teensy bit. I have a decent pain tolerance though, I think it comes from having a nurse mother who wouldn’t cut us any slack unless we were severely bleeding or broken, like, say…we swing into a table and break our collar bone, fall off a ladder, slam a finger shutting a window, or slice the tip of a finger off in a meat slicer. Not that any of those things have ever happened before, they’re just very specific examples. *ahem* Growing up, just about everything could be treated with ice, bacitracin, or gargling salt water. However, if I watch the insertion of a needle into my skin, it’s probably game over. I’ll probably face plant. Same with a tube filling with my blood. Yep, I’d rather not!! So all in all, that part was pretty easy. 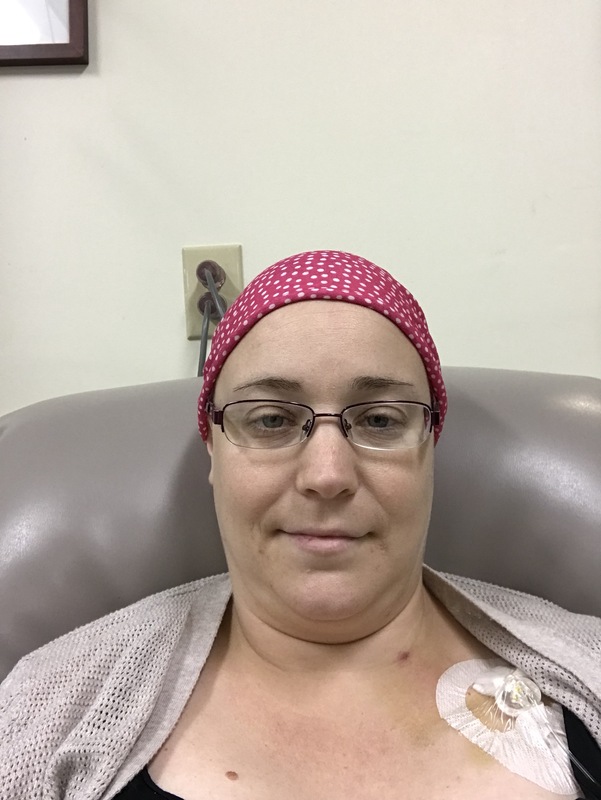 I thought I’d feel differently during the chemo since the port goes to my jugular, which goes directly to my heart, but nada. I might have felt tired from the Benadryl quicker, like almost instantly, but that’s about it. Oh, and the metallic taste from the saline flush, that was pretty instant, too. But nothing adverse, nothing strong. I was solo today. My dad dropped me off in the AM and both ‘rents picked me up in the afternoon because Brad had to work. My sister-in-law, Michele, brought me lunch! She was seriously the hero of the day…because food…and my dad did give me a mini bag of Chips Ahoy and peanut M&Ms. I ate the cookies for a morning snack. Yummy. I occupied myself well and the time seriously flew by! I read for a little bit, a fun book by R.S. Grey, The Foxe and the Hound. I did some crossword puzzles, and decided I need more puzzle books! Chemo really effs with your head, so I’ve read that games and stuff that engage your mind and keep you thinking are good for you. I play the heck out of Sporcle trivia on my phone, too. I tried to write a little, but by the time I started, I had about twenty minutes before the Benadryl drip started and it was pretty much game over for my attention span. So I shut down my computer, and resumed my crossword puzzles. It doesn’t sound like a lot, but it was enough to occupy me from beginning to end! I probably spaced out a bit, too. Not gonna lie. Ha. So here’s an interesting side effect/reaction I had. It goes to show just how toxic the chemo can be. It popped up right before my port surgery last week. 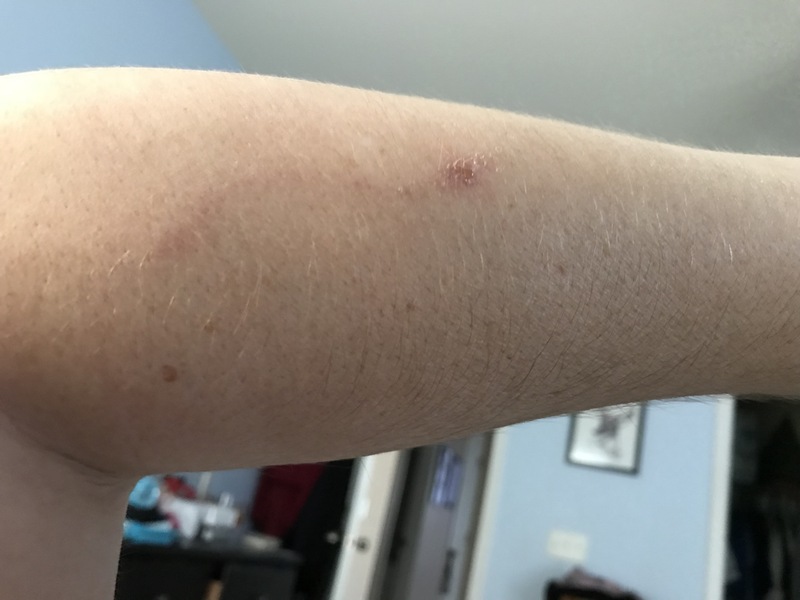 If you remember from an earlier image, a little to the upper right of the scab on my arm in that image is where my first chemo went in. That stuff is rough on veins, kind of makes more sense why they want to use stronger veins to administer it. So the reaction doesn’t hurt and there’s no numbness or bad feelings. It itched a little, but I’m not sure if it actually itched or if I was psychosomatically inclined to itch it because it was there. I don’t even know if that makes sense on paper, but it does in my head. And the scab was a little blister. So they checked it today and it’ll heal and fade, and I obviously shouldn’t use that vein for anything in the meantime to give it time to recover. And because I couldn’t not share this pic. Why is my dog so weird? It’s like she can’t gather the strength to hold her head up, so she’s resting on her nose. 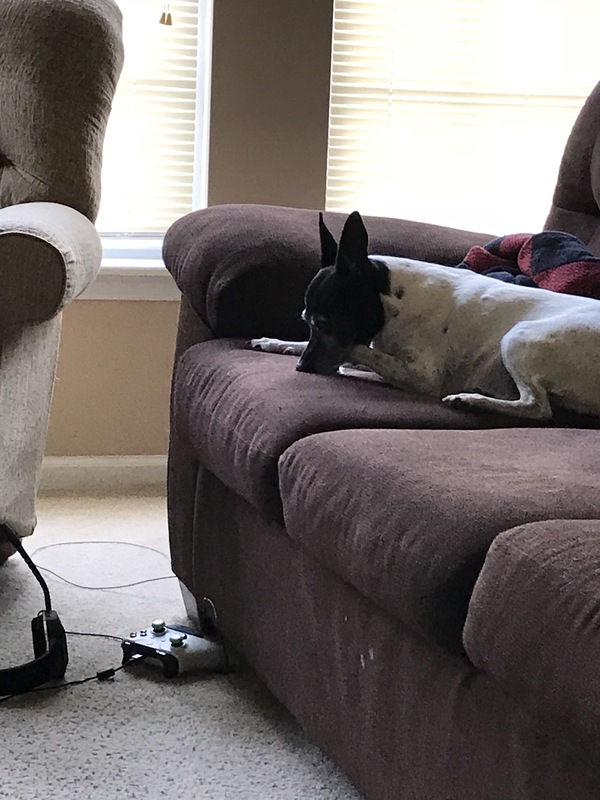 Either that or something smells really good inside the couch. Somehow, I think it’s the former and not the latter. So that was my day! Missed two sessions today, and fortunately class was canceled so I didn’t have to miss that, too. But I’ll be working tomorrow, and I’ll do my Neulasta shot at 3:30, missing only one session. Oh! And if anyone knows of any good, reputable, work from home gigs that are on the freelance side, let me know! Due to treatment and getting sick, I am missing some work (I’m an independent contractor all around, no work = no money! ), so I’d love to pick something up to try to make up some of the difference in income, but I’d need to have some flexibility. I have signed up with UpWork, just haven’t checked in routinely enough to snag any good gigs, but I will. The port has been placed, below you can see my battle scars from this procedure. I had to be at Roper downtown at 6:00am. Yowza! We made it by about 6:07, getting out of the house before 5:30am just isn’t something I do. *Shrugs unapologetically. * Check-in was quick, and we were sent to the 7th floor. I was in the surgical waiting room for a few minutes before being taken to my pre-op room where I put on the snazzy hospital gown and relaxed. The nurses did vitals, asked questions, hooked up my IV, and put on compression sock things for my calves (love!!!). The anesthesiologist came in, ran through his stuff, and I told him anesthesia is wonderful, of which I’m a firm believer! My surgeon came in, Dr. JB, marked me up (x marks the spot! ), and I waited a little bit to be taken to the OR. The anesthesiologist returned, said he was going to shoot some medicine into my IV, it made me a little loopy, the medical team chatted about chart stuff I didn’t understand. Then I woke up in recovery! Seriously, it was that quick. I think I said something about being loopy, then I was gone, apparently. I love general anesthesia. ❤️❤️❤️ So I slowly woke up, had some cranberry juice and an ice pack on the port site. Got dressed. My ride arrived, and I got discharge instructions. I took a wheelchair back down, and I was out of there. Stopped for a late breakfast on the way home, and now I’m resting comfortably in my bed. So the port site looks gnarly, I know. It’ll heal. The glue will wash off eventually, too. I’m out of commission for 24 hours due to the anesthesia. Fun times. I’m pretty tired, so I’ll probably nap. I’m sure it’s partially due to the anesthesia, and partially due to waking up at 5:00am. Prescription for pain meds has been dropped off, Brad will pick it up on his way home. 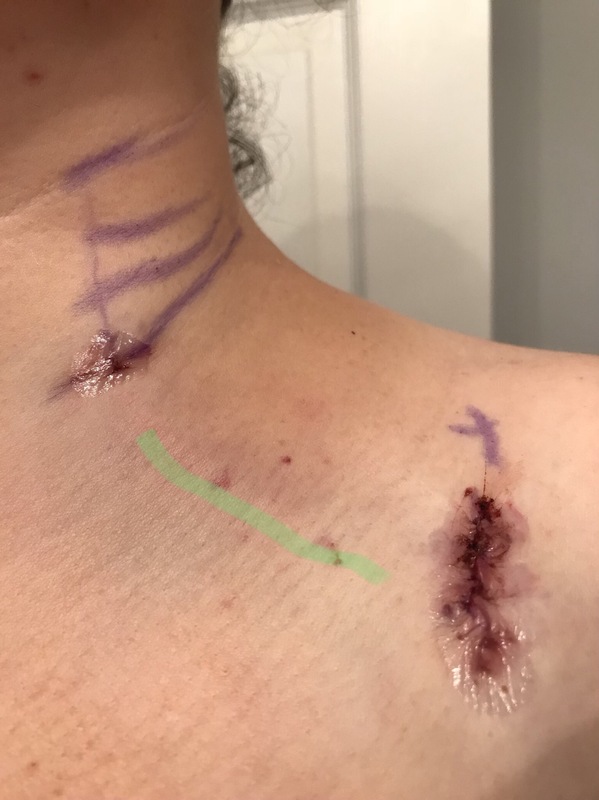 So in between the hole in my neck and the hole in my chest (I highlighted the line in the image below), there’s a tube under the skin, and you can feel it. It’s pretty neat. If you want to learn more about ports, here’s a link. I don’t know that it’s the exact one that I have, but it’s likely similar and might tell you better info than I can. I do have paperwork on my port, I just don’t feel like getting up to look at it at the moment. I’m excited (and exhausted) about the port. I’m going to name it, but I’m not sure what yet. Judi, a super graphic designer I know, named her port Pete the Port, so of course I have to name mine now. Can’t let JP have all the glory. So I’ll be thinking on that and will report back when I’ve got something. Anyway, the reason I’m excited isn’t just because I’m going to name the port, but because the port allows for easy access for the chemo! Yay. No more poking and picking at my arms, which will be especially useful for the days when I’m not super hydrated, and my veins aren’t cooperating. I have a prescription for lidocaine cream, I think I’ve mentioned that before, which I will apply before chemo to numb the skin over the port. So that’s about it for port day. I feel good, but tired. No pain at the moment, but I’m still using the reusable ice pack from the hospital (this thing is nifty, I’ll take a picture of it later!) and I’m sure I’m still feeling the effects of the anesthesia, too. I’m going to nap, maybe read a little (I can finally focus enough to actually read a book, rather than just listen to the audiobooks!! Victory!! ), and relax.